T. Boone Pickens has filed a lawsuit to protect his water rights in Hemphill County, a suit that highlights the problems with Texas’ attempt to regulate pumping from aquifers in the State. The suit, Mesa Water, L.P. and G&J Ranch, Inc. v. Texas Water Development Board, was filed in Travis County in April. Water is a little outside the scope of my blog, but this fight concerns the Ogallala Aquifer in the Texas Panhandle, where I was born and grew up, and so is of special interest to me. To understand the litigation, it is necessary to know something about the Ogallala and about Texas’ efforts to regulate underground water resources. Unlike other Texas aquifers, the Ogallala does not recharge — that is, water does not flow back into the aquifer to replenish the water pumped from the aquifer. So the aquifer is gradually being depleted as it is pumped out, lowering the level of water in the aquifer. Most of the aquifer water is used for irrigation of cropland. I grew up in Parmer County, in the western Panhandle, which lies over the Ogallala. My father was one of the first farmers in Parmer County to irrigate from the Ogallala. Irrigation changed the nature of farming in the Panhandle from dryland farming in an arid land that has an average of 15 inches or less rainfall a year to one of the most prolific agricultural areas of the U.S., growing corn, grain sorghum, sugar beets, wheat and vegetable crops with Ogallala water. Since my father started irrigating in the 1940’s, the portion of the Ogallala under his farm has depleted to the extent that it is no longer economical to irrigate the land. The land has reverted to raising dry-land crops. When he started irrigating the 960 acres in his farm, he could supply water to the entire farm from a couple of wells. By the time irrigation ceased in the 1980s from his farm there were more than a dozen wells, and they could not economically supply enough water to justify running the pumps. Large portions of the farmland over the aquifer have now been practically depleted as the water table has dropped. Nevertheless, huge sections of the Panhandle still are irrigated from the aquifer and produce vast amounts of agricultural crops. Texas water law has historically followed the “rule of capture.” Under that rule, the water beneath the land is owned by the landowner, and the landowner has the right to pump that water and use it for any purpose that is not economically “wasteful.” This is so even if the result is that water is drained from under the neighbors’ land. In a famous Texas water law case, Pecos County Water Control and Improvement District No. 1 v. Williams, in 1954, the Texas Supreme Court upheld the rule of capture in a suit involving Clayton Williams, Sr., the father of Clayton Williams Jr., one-time Texas gubernatorial candidate. 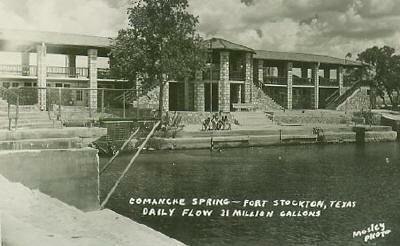 At that time there was a famous spring in Fort Stockton, in Pecos County. People came from long distances to bathe in its waters. Clayton Williams owned land to the west of Fort Stockton, and he began pumping huge quantities of water to irrigate his land, causing the spring to dry up. The Texas Supreme Court held that Williams was within his rights and had no liability for the fact that his withdrawals caused the loss of the spring. As Texas has become more populous and demands on its underground water resources have increased, the Texas Legislature has recognized the need to preserve these resources and fairly allocate the resource among landowners. At the same time, the Lege did not want to impose central control of the water resources, and so devised a legislative schem whereby underground water would be regulated by local water districts. There are now some 98 groundwater conservation districts in Texas, and more are being created each year. GCD Map.pdf Hemphill County, unlike most of the other Panhandle Counties overlying the Ogallala, is largely ranchland and does not have much irrigated farmland. Its county seat and the only town in the county is Canadian, with a population of some 2200 souls. The Lege also has required that each groundwater conservation district develop a comprehensive management plan which adopts “desired future conditions” for the aquifer or aquifers in its jurisdiction. That is, each district is supposed to decide how to best manage its groundwater by determining what it wants the condition of the aquifer to be at the end of 50 years. It must base its determination on models of the aquifer developed by the Texas Water Development Board that show how the aquifer will fare under different demands for water — different rates of withdrawal. 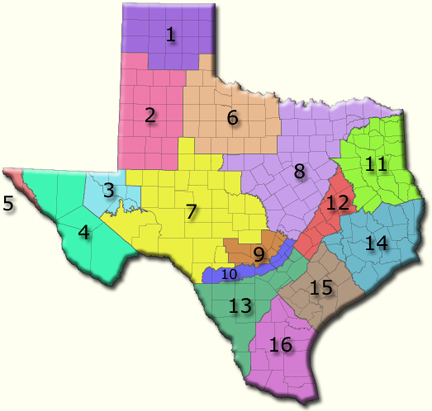 Moreover, the law requires that, where there are multiple conservation districts overlying an aquifer, those districts must confer and conduct joint planning with each other, so that (at least in theory) all districts agree on how the aquifer will be managed. Once these desired future conditions are set, a district must manage withdrawals from the aquifer — by controling how many wells are drilled, how far apart they are spaced, and how much can be pumped — so that the desired future conditions are met. At least that’s how it was supposed to work. In other words, the Hemphill County GCD decided that it wanted to limit pumping from its part of the aquifer so that, at the end of 50 years, 80% of the water now under the ground would still be there. the Hemphill County district board decided that it wanted to preserve the flows of natural springs in the county, and protect a growing eco-tourism business developing there. All of the other districts decided that, at the end of 50 years, only 40-50% of the water would remain — the rest, 50 to 60% of the water now in place, would be pumped out over those 50 years. Those districts viewed the water resource largely as an economic commodity to be mined over time to support their largely agricultural economies. Enter T. Boone Pickens. Pickens, through his company Mesa Water, L.P., has bought water rights in Hemphill, Roberts, Ochiltree and Lipscomb Counties — the four counties in the northeast corner of the Panhandle. Pickens saw an opportunity to sell the water to thirsty populations in the Dallas-Fort Worth and San Antonio areas. As he says on Mesa’s website, he believes that the Lege passed the new water laws to “encourage” transfer of the “surplus” water in the Panhandle to population centers where it was needed. He purchased half of the water rights under a ranch owned by George Arrington, a Texas oilman who owns 7,000 acres in Hemphill County. And Pickens has not been the only one purchasing Ogallala water rights. The Canadian River Municipal Water Authority, which provides drinking water to Amarillo and Lubbock, owns 43,000 acres of water rights in Roberts County, just west of Hemphill County; and the City of Amarillo owns another 72,000 acres of water rights in Roberts County, which it purchased in 1999 for $20 million. Water is big business. The Mesa suit identifies a basic flaw in the regulatory scheme adopted by the Legislature: it has allowed groundwater districts to be created based on political boundaries, but expects those political entities to agree on management of aquifers that may cross several district boundaries. River water in Texas, unlike groundwater, has always been considered “waters of the State” –that is, owned by the State and not by the owners of lands over which the rivers cross. For many years withdrawal of river water has been regulated by river authorities that encompass the areas drained by those rivers — the Lower Colorado River Authority, the Guadalupe Blanco River Authority, the Brazos River Authority, the Canadian River Authority, etc. The jurisdiction of these political subdivisions coincides with the water resource they are expected to regulate. Not so with aquifers. Until the Legislature fixes this problem and mandates consolidation of water districts so that their boundaries mirror the aquifers they are expected to regulate, fights like the one over the Ogallala will continue.